The all-new 3100j is the perfect entry-level tool designed to empower any consumer or technician when it comes to vehicle maintenance and repair. 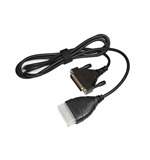 This code reader works on all 1996 and newer OBD2 cars, light trucks, SUV's, hybrids, and minivans. Quickly reveal the cause of "Check Engine" light warnings on any 1996 and newer OBD2 car, light truck, SUV and even Hybrids! Read and erase ABS & SRS light trouble codes on most OBD2 vehicles. Battery & Alternator tests check the performance of a vehicle's charging system. Oil Reset feature provides step-by-step reset procedures for most 1996 and newer OBD2 vehicles. Freeze Frame shows engine conditions such as fuel trim, engine coolant temp, etc., at the time the Malfunction Indicator Lamp turned on. Does the 3100j reset the maintenance light? Yes, the 3100j has the ability to reset the maintenance light. Please refer to our coverage chart for more information. Will the 3100j display live data and do bi-directional functions? No. The 3100j does not have Live data or bi-directional functions. Please refer to Innova’s Scan Tools for Live Data capabilities. Does the 3100j have the ability to read and clear ABS/SRS codes? The 3100j will retrieve ABS/SRS codes, on most 1996 and newer vehicles Domestic and Asian vehicles. Please refer to our coverage chart for more information. How can I clear of a stored vehicle? You will have to scan another vehicle to override a previous vehicle. There is no alternate way to delete a previous vehicle on the tool. Can the 3100j store more than one vehicle at a time? Yes, the 3100j will save the last 3 vehicles scanned.